In this section, we want to present the technical and constructional characteristics that make Le Fay basses so special. Sometimes customers have specific requests, for example a different combination of wood types, particular surfaces, etc. Most extras can easily be put into practice. Contact us and we'll gladly advise you. All Le Fay basses are available as fretless and left-handed models, without any additional charge. The Le Fay truss rod is made of stainless steel with finest thread and torsional protection, and produced in our own workshop. The torsional forces of the screw are not transferred into the neck. Each truss rod is individually tailored to the respective neck, because every neck needs different steel characteristics. We want bassists see the neck screw as a perfectly normal adjustment mechanism with which they can adjust the neck to suit their own individual needs, by themselves, without any hassle. The screw is covered by a piece of ebony, which we call a "penulpe". Held by magnets, it just takes a bit of pressure on one side of the cover and the screw becomes accessible. All Le Fay necks are reinforced with carbon. This wonderful material brings amazing stillness into the neck. From now on, each of our basses, apart from the instruments with steel fingerboards, will feature this detail. The neck profile on all our instruments is designed such that the widest part of the neck is located within 4 to 6 mm below the edge of the fingerboard. The profile tapers to the surface of the fingerboard. 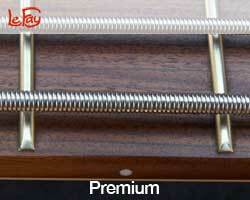 As a result, also on the “standard” version, there’s no unpleasant contact between the fretwork and the fret ends. All our instruments come with covered (not continuous, i.e. invisible) fret cuts. On the “standard” fretwork, after the fret bars have been driven into the neck, they are smoothened until they are plane with the edge of the fingerboard and rounded, which makes the instrument very enjoyable to play. On the “premium” fretwork, the fret bars are already dimensioned and rounded before they are driven into the neck, which makes it possible to have them slightly further back from the fingerboard. A particularly elegant way of arranging the fret ends. What is B BOW? The fingerboard has increasingly more slack from the G to the B string. If you want to achieve an asymmetric slack with 2 truss rods, you have to put up with a screw-type twisted neck. For us, that’s out of the question. This is why the asymmetric slack of our B BOW neck is specially created and shaped. By way of meticulous further processing from sanding the fingerboard to truing the frets, the intentional asymmetry is maintained in the final result. That makes it possible to set the neck for the G string almost straight, and to automatically give each of the next strings approx. 1/10 mm more slack. This enables all the strings to swing off freely with a perfect neck curvature, ideally suited to the relevant string. The frets are trued differently than on a standard fingerboard, but it’s no problem with simple tools if you stick to certain rules and a specific order when you carry out the individual steps. In our opinion, from a service-technical point of view, this is a better solution than 2 truss rods. 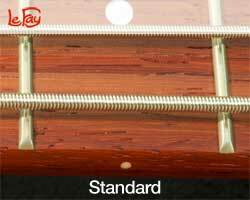 The bassist can adjust the neck with the truss rod as usual and nevertheless enjoy the B BOW’s benefits. A visit to a specialist workshop is not necessary. B BOW is optionally available for all 5- and 6-string Le Fay basses. Our Le Fay PIPE allows us to remove 25% less body wood compared to a conventional neck fit. This area is now more stable and that opens up new possibilities for bodyshaping. Due to the gained stability in the area of the neck fit the back of the body can be made thinner. This improves the ergonomics, and the instrument wraps around the player even better. We only use high-quality electronic components in order to guarantee the longest possible lifespan of the potentiometers, switches, output jacks and battery clips. All casings for the onboard electronics and electronics tray covers are fully shielded with copper foil. An explanation of how the potentiometers and switches work is available in the DOWNLOADS section. 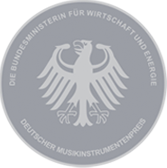 The 2-band active electronics from Andreas Richter are made using the finest components. We have paid special attention to neutrality and the device does not give off any discernable sound timbre of its own. These boost-only electronics work with 9 volts and max. 8 dB boost. They are absolutely distortion-free and yet highly energy-efficient. The lifespan of the batteries is about 1000 hours!! Another point definitely worth mentioning is the way the bass control works. Below 30 Hz, no boost effect takes place, because these sub-basses are suitable for neither the studio or for the stage. We concentrate on the range around 80 Hz. In the treble range we boost as of approx. 1,5 kHz, open-ended. The passive treble cut also works in active mode, thus providing interesting nuances in conjunction with the active treble cut (vintage inside). Some Le Fay basses are fitted with an external battery case. Here too, just a slight bit of pressure on the edges of the magnet-held cover allows access to the battery without the need for any tools. Unfortunately, you will only need it very seldom, although it's really lots of fun. But one could, of course, use the excuse that you have to check if the battery is still there now and again. All our covers for the onboard electronics are made of high-quality, charcoal-grey acrylic glass. We arch the covers in a process specially developed by us to equally integrate this element in the shaping. In addition, the arched shape gives the cover immense stability. The cover is attached with black screws in threaded steel sockets. We have been winding Le Fay pickups for 20 years. The casings, too, are produced in our workshop. This is how, in addition to our "standard" pickups, we have created extra-large diamond-shaped Humbuckers and the bat pickup for some 4-string instruments. All Le Fay pickups are sized and shaped according to the string alignment – an important visual and functional detail. It seems only logical for the neck pickup to be shorter than the bridge pickup. With the 6-string in particular, this has a massive effect on the overall appearance. Le Fay produce their bridges of solid aluminium. Designed according to "equal clear widths", this bridge does without any adjustment mechanism on the side. The saddles are arranged in a fan-shaped manner and thus follow the string alignment. They are screwed onto the base plate, thus guaranteeing optimal transmission. The Le Fay tuning bridge works with one-piece traction bars, lathed and milled out of one piece, with M5 fine thread. Backlash-free bearing-mounted tuning screws guarantee the utmost in tuning stability. Unique are the fastening bits of the headstock basses with Le Fay tuning bridges. They are made of solid brass, but weigh only 7 grams (mechanics 45 g). Changing the strings is really quick and you don't need any tools. Simply winding the string around the bit in the form of an eight is fine. The string will pull itself taut. The typical Le Fay body shaping turns one part of the weight into pleasant contact pressure against your body so that the basses feel lighter when worn with a strap. A Le Fay rests steadily and well-balanced, never top-heavy. Also on the player's leg, when played without a strap, it stays in position. You can let go of it without it toppling over. That way all the player's energy and concentration can go into the bass line. The unique body line that makes this possible is a feature of all Le Fays. Typical of our Remington Steele is the steel fingerboard. For many fretless bassists this promises a new sound experience with previously unknown forms of expression. Remington Steele is a bass with a strong character, surprisingly natural and by no means metallic in sound. Due to the immense stability of the steel fingerboard, we did without any carbon in this bass. The open-pored satin finish, for example as used for the Herr Schwarz, which feels soft as silk while maintaining the feeling of the wood's texture as much as possible. We only apply this finish on wood that has sufficient intrinsic hardness: ash, wenge and padouk are well-suited. With the sealed-pore satin finish, we create an ultra-thin, silky surface that feels almost velvety and makes you want to stroke it. Very work-intensive, it involves a highly sophisticated production process, because the lacquer has to be applied without any sags and dust-free straight from the spray gun. Retouching or polishing is not possible. Our high-gloss finish involves the same work processes as the sealed-pore satin finish until the final coat is applied. In the last step, transparent varnish is sprayed on, sanded very finely and then polished. The result is a crystal-clear, brilliant and yet very thin layer of lacquer.